You will find here all the material about FlowMotion Golf. ​You should have any questions for an article or just for your own curiosity ? 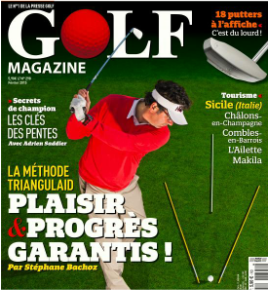 ​Article in the n°1 French golf publication staring Stéphane Bachoz and FlowMotion Golf method. This article is mainly about the full swing and it can be considered as a good introduction to the FlowMotion concepts. "​The lesson you’ve been waiting for... Stéphane Bachoz on finding a Natural Golf Swing"
Introducing the Zen Oracle Putter - World's first Tour proven putter that combines patented "FlowMotion" training system that's guaranteed to improve you stroke. Discover the adding value of having "FlowMotion" Golf Skills in your bag. You will have a tool which gives you the ability to enhance your golf results very quickly. From Full Swing to Putting and also have a better understanding about your own mechanical and mental preferences.